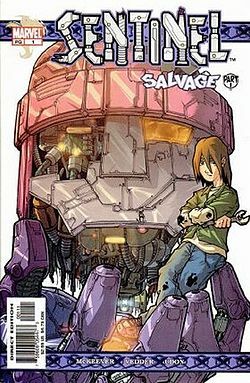 Sentinel was a short-lived series that Marvel put on the market about 8 years ago as part of one of their many failed attempts to capture the “youth” market, that doesn’t really exist anymore in modern comics. While I’m a fan of writer Sean McKeever, and generally like his work, there isn’t much to recommend here. It’s a cute enough story, but if you really want a great story about a loner kid and his giant robot, watch The Iron Giant. This is one of Marvel’s weirder experiments, and one that eventually succeeded, though perhaps not in the way Marvel intended. 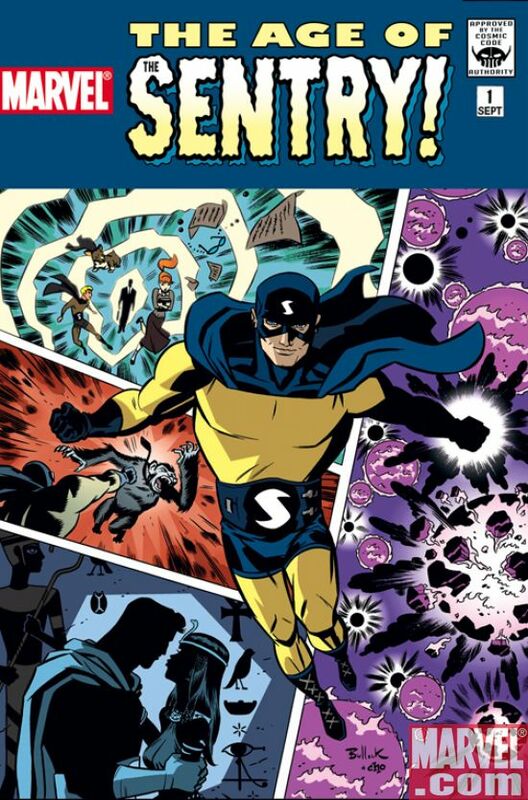 The Sentry was one of the greatest marketing ploys in the history of comics, but also a great example of organic, fan-based storytelling. Here’s how it played out: In 1998, Marvel “leaked” to Wizard Magazine, that they had “discovered” a lost silver age character that had been created by Stan Lee, and by a fictional creator named Arnie Rosen. This got some attention, until Marvel finally fessed up and acknowledged that it was a hoax. They continued the premise of this being a “lost” hero in the pages of the first Sentry comic, and Paul Jenkins fabricated a complicated story about someone who was actually the greatest hero of his generation, but no one (including Marvel’s other heroes) could remember him. As a marketing ploy, this was brilliant. But as a character, the Sentry never clicked with audiences. The original series itself wasn’t that good, and was less of a cohesive story than it was a series of vignettes told by various characters in the Marvel universe. It suited Jenkins writing style, and there are few nice character moments, but it just didn’t work as a story. After the mixed reaction to the original series, Marvel put the character on the bench for a few years until he was finally brought into Brian Michael Bendis’ New Avengers. Bendis’ shrewdly recognized that the character wasn’t really that likable, and used some of the mental instability that Jenkins had written into the character earlier as a major plot point. So now you have the most powerful being on earth, slowly going nuts. And it worked. It created a lot of tension, and the Sentry served as an effective deus ex machina in Marvel’s books for the next several years. As plot point in a team book, The Sentry worked exceptionally well. But as the lead character in his own heroic comic book? Not so much. I don’t think that the female breast has ever had a more passionate champion than Frank Cho. He’s such a big fan, that if they didn’t exist already, I think he would have had to create them. And so we have Shanna The She-Devil, which isn’t really a story about Shanna so much as it a story about how Marvel is smart enough to let the preeminent penciler of curvy women, do a comic about curvy women. And as a generic jungle adventure Shanna The She-Devil works. Barely. But there really isn’t anything to this story other than: Pretty Girl In Bikini, which is fine if you’re reading a book of pin-ups, but not fine if you want a cohesive serial adventure. This was a cull for me, but it’s a fine example of why Cho is one of the finest pencillers in the game today. Next up: She-Hulk! She’s like the Hulk, but with breasts! This entry was posted in Comic Books and tagged Comics, Frank Cho, Marvel, Paul Jenkins, Sean McKeever, Shanna The She-Devil, The Sentry. Bookmark the permalink.